I’ll set the scene up for you. You’re cooking dinner for your family, and you just cut up some raw chicken. As you’re walking to the trash, you realize your hands are covered in raw chicken juice. You bend down, and you’re trying to open the trash can with your elbow, so you don’t contaminate the lid and before you know it, you’re making a bigger mess attempting to throw garbage away. I know this has happened to all of us on multiple occasions, and there is nothing that disgusts me more than an unsanitary kitchen. With the hands-free feature, this makes storing trash much easier. I no longer have to touch the garbage can when I’m trying to throw something away while I’m in the kitchen. With a step feature, many would think the lid would fly right open, but the lip opens easily. It also slowly closes and barely makes a sound. Because of the stainless steel, it is unlikely to smell the trash through the can. Stainless steel does not absorb odor as much as plastic trash cans do. Everyday use of a plastic can will faintly smell at first, but will gradually get worse the longer you have it. Out with the old and in with the new is what they say. Stainless steel gives a nice modern look to your kitchen, and it is also durable. Sure, a plastic trash can is somewhat durable, but it is more likely that they will crack and break if they are dropped. Once there is a crack, it could start leaking and no one wants to clean up more than they already have to. A trash can make of stainless steel is a lot more durable because of the fact that it is made of metal instead of plastic. Although a stainless steel can certainly get a dent, it is less likely than a plastic can. The rectangular form of this trash can make it easy for you to store your unit in a neat fashion. Also, this product has a space-efficient shape so you can place it directly against the wall and keep it out of the way. As with a lot of online purchases, We had to see what the pros were. On the other side, We needed to see what the downsides of this product were. After reading the cons, We looked further into the features to see what made it stand out. Q: Does this trash can use standard kitchen trash bags? A: Yes, it uses regular kitchen trash bags, which is 13 gallons. A: There is a 5-year warranty that comes with the purchase of this trash can. Q: Is there a stay-open feature? A: There is a stay open feature. If you open the lid, there is a red tab that you slide, which will allow the lid to stay open for whatever reason you need it to. It is obvious that there are certainly more pros than cons for this trash can. If you look at all the reviews for this product, you will notice that there are not many negative things to say about it. 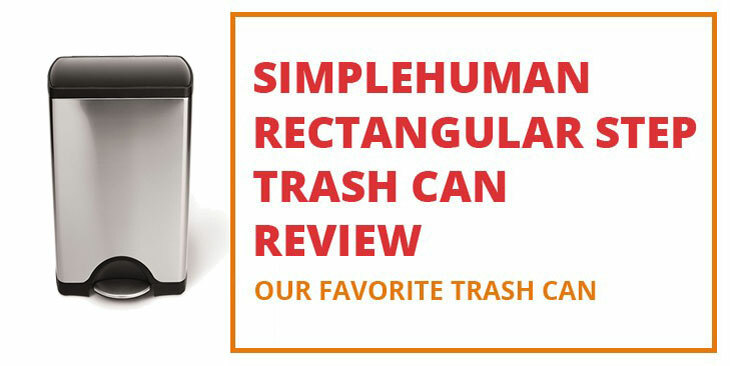 Simplehuman produces quality products that remain reviewers favorites, such as this stainless steel trash can. Though the only downfall for the product is the price, you should realize that you are paying for a higher quality trash can that will last longer than others. The stainless steel will give a modern feel to your kitchen and is easy to match with other kitchen appliances. The perks of this product will outlook the few cons if any. Lastly, If you still think that, this trash can is not a perfect fit for your needs than don't forget to check our best kitchen trash can list.